A strong tradition of non-violence is one of the most striking features of ancient Indian religious history. Jainism and Buddhism, both of which were non-god-oriented and emphasised renunciation as the path to liberation, stress the importance of ahimsa. Non-violence also appears in the Brahmanical tradition, in association with the idea of the sannyasi and as one of the elements of samanya-dharma or sadharana-dharma, the dharma that applies to all, regardless of social class or gender. Within Hinduism, non-violence also came to be associated with Vaishnavism. To what extent did religions centred on non-violence rem­ain true to their original principles in the long run? 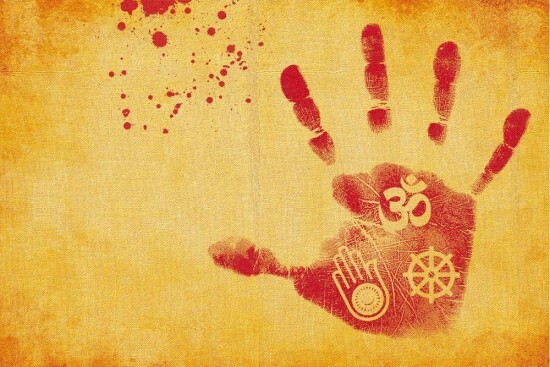 Are followers of ahimsa-oriented religions more non-violent or compassionate than others? To what extent did the ethics of non-violence have an impact in the political sphere, especially in the attitudes towards war? Jainism is the most non-violent of all ahimsa-oriented religions; members of the monastic community and laity are supposed to practice ahimsa, alt­hough in different degrees. In Jaina texts, attitudes towards war range from disapproval to ambivalence, tacit acceptance and justification. Killing in war should be avoided. So, for inst­ance, in the eighth-century Adipurana, Bahubali fights his half-brother Bharata for his kingdom to prevent a war. Although he overpowers Bharata, he does not kill him, and instead heads to the forest in search of liberation. In the Jaina Ramayana, Rama does not want to kill Ravana. Lakshmana commits this act and goes to the same hell as Ravana. On the other hand, in the Samayasara, the Jaina monk Kundakunda states (this seems to be an echo of the Bhagavad Gita) that a person who thinks he kills or is killed is ignorant, and that death and killing are results of actions in previous lives. A verse of Soma­de­vasuri has been interpreted as implying that alt­hough killing in a defensive war should be avoided, it is acceptable for the laity. There is no such thing as a non-violent war. History tells us that Jaina kings fought wars, and Jaina monks prophesied their outcome. Kharavela, the ruler of Kalinga, boasted about his military victories in his Hathi­­gumpha inscription. Later, Ganga, Rashtrakuta, and Hoys­ala kings with Jaina leanings fought as hard as those of other religious persuasions to expand their dominion. The Ganga general Chamundaraya was as fam­ous for his ferocity in bat­­tle as for patronising the building of the colossal Bahu­bali statue at Shravana­belgola. Clearly, Jaina kings were not pacifists. Buddhism too displays a range of attitudes towards pol­itical vio­lence and war. Alth­ough most Jataka stories emp­­hasise non-violence and compassion, many a Bodh­isattva (Buddha-to-be) fights wars. Non-violence was an imp­ortant part of Buddhist ethics for monks and the laity. But it could be arg­ued that an enlightened arhat (one who is worthy or a member of the elite class) was beyond the purview of ordinary morality. Mahayana schools adv­ocate friendship (metta) tow­ards all beings. The idea of the Bodhisattva who leads others towards liberation embodies compassion, but the doctrine of emptiness (shunyata) could be used to dilute the moral force of non-violence. Certain Mahayana and Vaj­rayana texts seem to condone the idea of killing out of compassion. The Buddhist king Ashoka famously renounced war, but his warning to the forest tribes shows that he was not a complete pacifist. In the history of Asian Buddhism, Buddha relics came to be closely connected with warfare. In Sri Lanka and Burma, wars were often justified as part of the quest to acquire relics. The episode of Mara’s attack on the meditating Siddhartha, an important incident in the Buddha’s sacred biography, acquired great symbolic political significance. For instance, in sixth-century Tang China, rebel monks invoked it to justify their violent revolt. Interestingly, no such episode of Buddhist violence is recorded in ancient Indian history. The key to the violent potential of religion lies in its connection with politics. The issue of politically-inspired religious conflict is a volatile one these days. What was the situation like in ancient times? Between the 6th century BC and 7th century AD, we hear of three major episodes of religi­ous persecution, and interestingly, all of them are recounted in Buddhist texts. The first of these is connected with Push­yamitra Shunga (2nd century BC). We are told that Pushya­mitra decided to destroy the 84,000 stupas that Ashoka had built and marched with his army to the Kukkutarama monastery. When the king offered the monks a choice of keeping either the 84,000 stupas or the 84,000 monasteries, they chose the former. He then destroyed the monasteries, killed the monks, and offered a reward of 100 gold coins to anyone who brought the head of a Buddhist monk to him. According to the archaeologist John Marshall, the brick core of the great stupa at Sanchi revealed evidence of considerable, deliberately infli­cted damage. Marshall conne­cted this with the activities of the Shunga king. Pushyamitra has also been held responsible for destroying the Gho­shi­ta­rama monastery at Kau­shambi and the Deor­ko­thar stupa in central India. Yet we know that Sanchi and other Budd­hist monasteries in central India continued to exist and flourish during the Shunga per­iod. Was this in spite of Pushyamitra’s persecution of the Buddhists? Was it because later Shunga kings discontinued his anti-Buddhist policy? Or was it because the growth of Buddhist monasteries was not really dependent on royal patronage or the lack thereof? The Hunas too are singled out in Buddhist texts for violent rel­ igious persecution. The Huna ruler Toramana has been held responsible for destruction of the famous Buddhist monastery at Kaushambi. Toramana’s successor Mihirakula (who seems to have been inclined towards Shaivism) acquired an even stro­nger reputation as a persecutor of the Buddhists. The seventh century Chinese monk-­­traveller Xuanzang desc­ribes him as cruel and oppressive toward Buddhists, and this is endorsed much later by the 16th/17th century Tibetan traveller Taranatha. Excavations at the Dharmarajika stupa at Taxila revealed evidence of a fire, severed heads, dismembered bodies, and skulls bearing injury marks. John Marshall int­erpreted this as evidence of a Huna massacre. Even if the scale destruction is not as great as what would be expected in a massacre, the archaeological evidence does point towards a violent event. The fact that many types of arr­owheads were found within the Dharmarajika monastery indicates a threat perception. The Chinese pilgrim Songyun, who visited Gandhara in the early sixth century, attributed the destruction of the Gandhara monasteries to the Hunas. According to Xuan­zang, Mihirakula destr­oyed 1,600 monasteries in Gandhara and had 9,000 men killed or sold into slavery on the banks of the Indus. On the other hand, an inscription found at Kura in the Salt Range records the building of a Buddhist monastery by a person named Rotta Siddhavriddhi during the reign of Toramana. The donor exp­resses the wish that the religious merit gained by his gift be shared by him with the king and his family members. So, Buddhist monasteries were being built during Huna rule. Did Mihirakula indulge in act­ive persecution of Buddhists? Or was he cast into the role of a cruel anti-Buddhist ruler bec­ause Baladitya of Magadha, one of his arch political opponents, was an ardent patron of the Buddhist sangha? The int­eresting thing is that ninth- and tenth-century Jaina texts des­cribe Mihirakula as a wicked, oppressive tyrant who was anti-Jaina. Buddhist texts accuse Pushyamitra, Mihirakula & Shashanka of persecution. Are they just resentful of lack of royal patronage? Another king who acquired a reputation for persecuting Buddhists was Shashanka, who ruled in eastern India in the early seventh century. According to Xuanzang, he des­troyed monasteries, cut down the Bodhi tree, and tried unsuccessfully to replace the image of the Bud­dha at Bodh Gaya with one of Shiva. Shashanka was a rival of Harshavardhana, king of Kanauj, who was inclined tow­ard both Shaivism and Bud­dhism. So was the Bud­dhist picture of a villainous Sha­­sh­anka cast against the background of a bitter political conflict? Even if we do not take such accounts of religious persecution literally and make allowance for exaggeration, do they point towards active political violence? Or are they expressions of resentment at a lack of royal patronage and support? Or do they recast political conflicts into religious moulds? As the perpetrators of the acts cited above were kings, they have to be viewed as political acts, but their perception and presentation as religious persecution cannot be ignored. Nevertheless, these episodes are exceptions rather than the rule. The absence of large-scale religious violence in the early period was in large measure the result of the relationship bet­­w­een kings and the religious dom­ain. While inscriptions inc­re­asingly announced kings’ rel­igious or sectarian aff­­il­iation, rulers usually exte­nded their patronage to a variety of beneficiaries. No religion bec­ame a ‘state religion’. However, over time, as religious and sectarian identities hardened, and the stakes for pol­itical patronage rose higher, expressions of religious hostility became more frequent, int­ense and violent. For instance, we hear of sharp conflicts bet­ween the Vaishnavas, Shaivas, Jainas and Buddhists in South India. We know of Hindu kings carrying off religious images from the temples of their adversaries as war trophies. The Pallava ruler Mahendravarman (who is said to have oscillated between Shaivism and Jainism) is acc­used of having persecuted the Shaivas and the Jainas. The hagiographic accounts of Shankaracharya’s digvijaya suggest a milieu of strong religious contest. The material evidence presents a mixed picture. On the one hand, there are reflections of symbolic violence in early medieval images, of deities trampling on their rivals; On the other, images of Hindu deities found at Buddhist sites such as Nalanda suggest their incorporation into Buddhist worship. So it becomes necessary, but not easy, to distinguish between actual violence, symbolic violence, religious rhetoric, and violence as part of political ideology. Evidently, the discourse of non-violence, which was so prominent in a section of the religious sphere, had little imp­act on political practice. Ashoka famously renounced war after the Kalinga battle, but no other ancient Indian king, Buddhist or otherwise, followed his exa­mple. Although ancient Indian thinkers were acutely aware of the tension between violence and non-violence, there is no reason to believe that social and political life in ancient India was marked by significantly lower levels of violence than elsewhere in the world. The reason why the principle of non-violence did not have any significant impact in the political sphere seems to lie in the pragmatic ambivalence of the dominant religious traditions. Even the ahimsa-oriented religions tacitly accepted that a certain amount of violence was necessary in politics. While inscriptions announced kings’ religious or sectarian affiliation, rulers extended patronage to a variety of seekers. In the long history of politico-­religious conflicts (more so in the context of medieval India), there are two sorts of app­roa­ches. One is to deny the exi­st­ence of such conflicts; the other is to exaggerate their impact. These approaches are geared towards an interest in promoting either communal harmony or communal polarisation in the present, in either denying or providing a legitimacy to the settling of old historical scores. But beyond such approaches that view history in terms of her­oes and villains is another possibility—of seeing various kinds of violence as a part of Indian history from ancient times onw­ards and trying to und­erstand its forms and cont­exts, justifications and critiques. History is part of the past. It is over. While we need to understand history, and cannot esc­ape it, we must not become its slaves, reacting to one or other version of events that may or may not have happened centuries ago, in very different times, in very different contexts. There is a difference bet­ween history, cultural memory and creative interpretations based on either; one cannot be red­uced to the other. Finally, our desire to have harmony among religious communities and a politics free of violence should not be based on selective constructions of the ancient or med­ieval past. It should be based on the modern principles of dem­ocracy, freedom, equality and the rule of law.